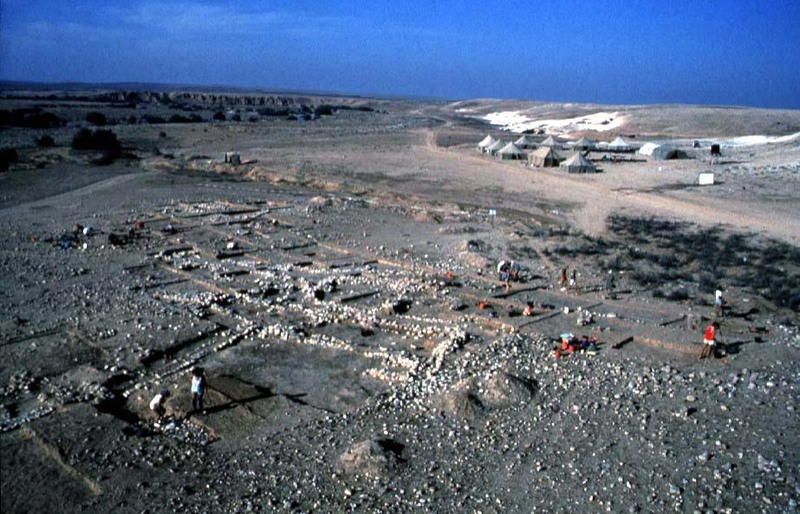 The largest Chalcolithic village in the Nahal Beersheva valley (9.5 hectares or 24 acres), Shiqmim has been identified as a major chiefdom center, with evidence for social stratification, political integration, wide-ranging trade relations, metalworking and other craft specialization (Levy et al 1991). Four Chalcolithic strata were identified (I-IV) though only Strata I and II have anything approaching coherent plans. A series of C14 assays have resulted in calibrated dates ranging from 5500-3300 BCE, with the majority falling in the 4500-3600 BCE range (Burton and Levy 2001: 11-12). The site was first identified by David Alon in the early 1950s. 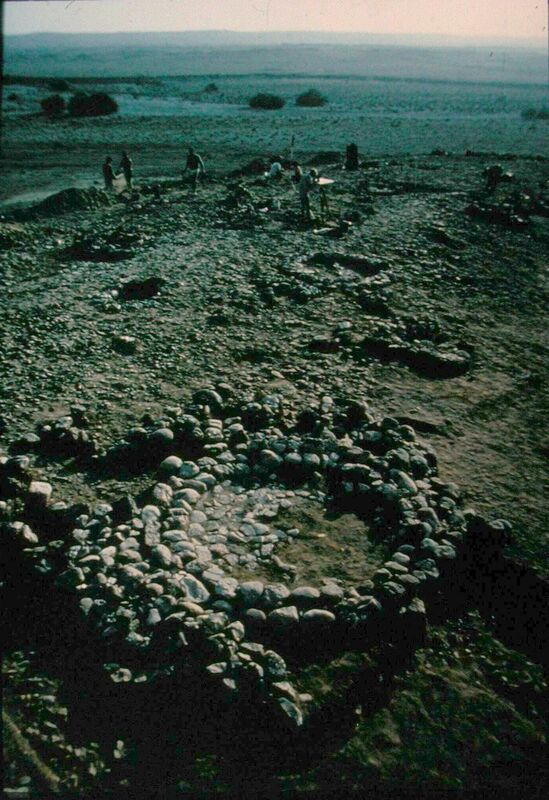 Survey work in the valley carried out from 1977 to 1980 by Alon and Thomas E. Levy showed that this site was a regional center, surrounded by six smaller sites. From 1979 to 1984, the Israel Department of Antiquities and Museums, together with the Negev Museum carried out excavations at the site. From 1987 to 1993, Levy, then of the Nelson Glueck School of Biblical Archaeology, Hebrew Union College Institute of Religion and now at the University of California at San Diego, was the principal investigator. The settlement displays both above-ground and below-ground features. The series of underground rooms and tunnels were first thought to represent the “pioneer phase” of architecture fashioned by pastoral semi-nomads, following the model of Jean Perrot (e.g. 1984, Levy 1997). Elsewhere, Levy posits that the underground system was a defensive measure, somewhat parallel to the underground hideouts constructed by rebels during the Bar Kokhba Revolt of the Roman period (Levy et al. 1991). Some of the Levant’s earliest evidence for violent conflict between people was found in the form of blunt object trauma to human bone in a pre-mortem state (Dawson, Levy and Smith 2003). Other scholars have suggested that the subterranean systems of the Beersheba Valley in general, including Shiqmim, are contemporaneous with the above-ground construction, emphasizing their potential as storage space (Gilead 1994). One might also make the case that they were burial vaults for primary interment, prior to the bones’ removal for final burial in a separate cemetery nearby (Ilan 1994). The above ground architecture was rectilinear, in the best Chalcolithic tradition, including dwelling chambers, animal corrals, courtyards, and storage bins. A number of ritual caches and altars were identified, several of them on the outside edge of the terrace into which the subterranean system was carved out. Above the settlement, and above the Nahal Beersheva terraces, on the ridges on either side of the site, cemeteries were found containing a combination of cists and above-ground grave circles. Only the latter contained human bones, in secondary deposition, and these in a poor state of preservation. Fragments of an ossuary were reported, as well several other grave goods (Levy and Alon 1982, 1985a and 1985b). Burton, M. and T.E. Levy 2001. The Chalcolithic Radiocarbon Record and its Use in Southern Levantine Archaeology. Radiocarbon 43 (2): 1-24. Proceedings of the 17th International 14C Conference, eds. I. Carmi and E. Boaretto. Dawson, L., Levy, T.E. and Smith, P. 2003. Evidence of Interpersonal Violence at the Chalcolithic Village of Shiqmim (Israel). International Journal of Osteoarchaeology 13: 115-119. Gilead, I. 1994. The History of the Chalcolithic Settlement in the Nahal Beer Sheva Area: The Radiocarbon Aspect. BASOR 296: 1-14. Ilan, D. 1994. Temples, treasures and subterranean villages: Death’s Dominion in the Chalcolithic of Canaan. Paper presented at the Annual Meetings of the American Schools of Oriental Research. Levy, T. E. and Alon, D. 1982. The Chalcolithic Mortuary Site near Mezad Aluf, Northern Negev Desert: A Preliminary Study. BASOR 248: 37-59. Levy, T. E. and Alon, D. 1983. Chalcolithic Settlement Patterns in the Northern Negev Desert.Current Anthropology 24:105-7. Levy, T. E. and Alon, D. 1985a. 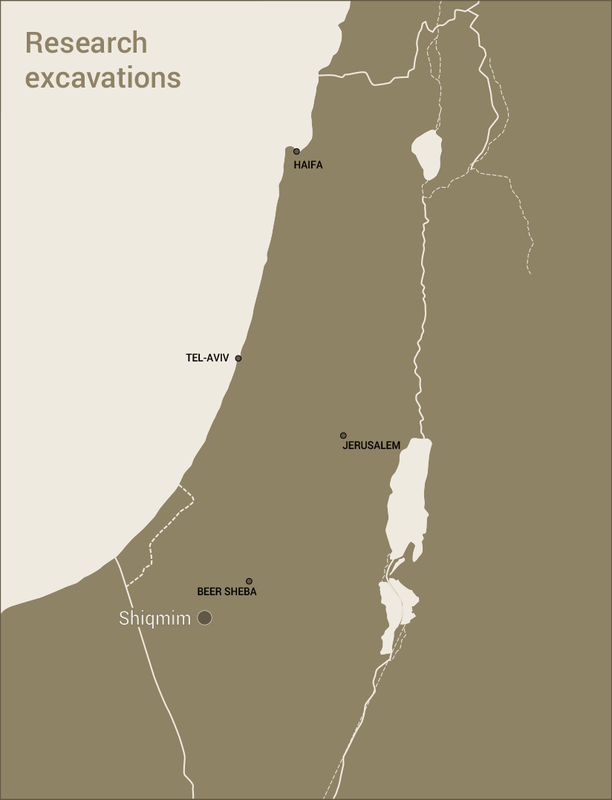 Shiqmim: a Chalcolithic village and mortuary centre in the northern Negev. Paleorient 11: 71-83. Levy, T. E. and Alon, D. 1985b. 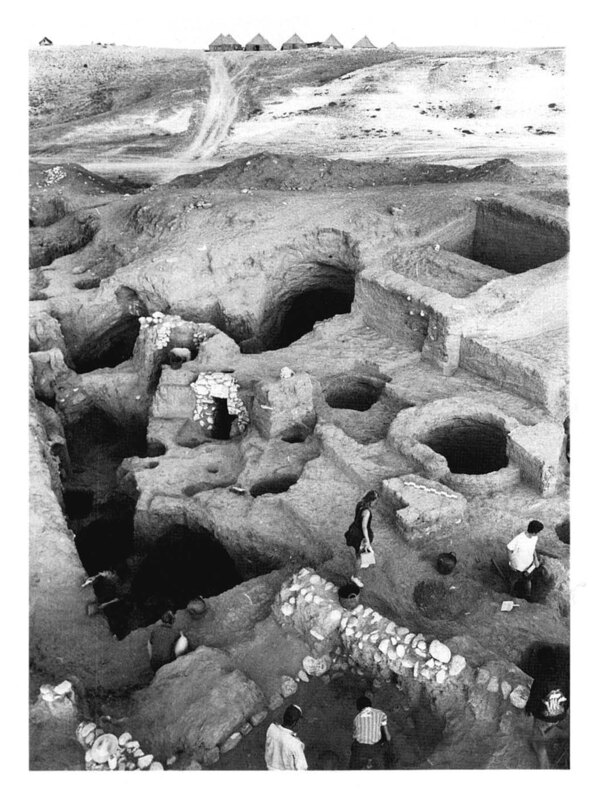 The Chalcolithic mortuary site near Mezad Aluf, northern Negev Desert: third preliminary report, 1982 season. BASOR Supplement No. 23: 121-135. Shiqmim 1984. IEJ 35: 74-76. Levy, T. E. and Alon, D. 1987a. Excavations in the Shiqmim Valley. In Levy, T. E. (ed. ),Shiqmim I, BAR International Series 356, Oxford, pp. 153-218. Levy, T. E. and Alon, D. 1987b. Settlement patterns along the Nahal Beersheva–lower Nahal Besor: Models of subsistence in the Northern Negev. In Levy, T. E. (ed. ), Shiqmim I, BAR International Series 356, Oxford, pp. 45-138. Levy, T.E. and Alon, D. 1987c. Excavations in Shiqmim Cemetery 3: Final report on the 1982 excavations. In Levy, T. E. (ed. ), Shiqmim I, BAR International Series 356, Oxford, pp. 333-355. Levy, T. E., Alon, D., Grigson, C., Holl, A. Goldberg. P., Rowan, Y. and Smith P. 1991. Subterranean Negev Settlement. National Geographic Research and Exploration. 7: 394-413.